Most of us spent long, tedious hours in childhood, struggling to copy and learn a twin set of abstract symbols - our native alphabet. As adults, we hardly think consciously of these symbols any more - we have no need to; we can write, we can read, we can communicate on paper or on electronic screens. But these letters of the alphabet, these building blocks of communication, all have a tale to tell. And, for Europeans, none more so than the Greek alphabet. The very name "alphabet" derives, via Latin, from the first two letters of the Greek alphabet. Christians among us are familiar with the Biblical quotation: "I am Alpha and Omega, the beginning and the end." (Revelations 21:6). Mathematicians, scientists and physicists universally use systematic terms and names derived largely from Greek (and Latin). One in ten words in the English language is of Greek origin. Yet, unless we are actually Greeks or Cypriots, minorities living in parts of Turkey, Italy and Albania, or foreign language scholars or scientists, the Greek alphabet remains a closed code to us today. Today the alphabet is used almost exclusively to write Greek. However, at various times in the past it has been used to write such languages as Lydian, Phrygian, Thracian, Gaulish, Hebrew, Arabic, Old Ossetic, Albanian, Turkish, Aromanian, Gagauz, Surguch and Urum. So, why insist today on the significance, the importance of this alphabet of generally indecipherable letters? The fact is that all western European, and indeed the Glagolitic and later Cyrillic alphabets, have been derived from an ancient Greek root - the Cumae, or Koine ("common"), alphabet. This was a western variant of the early Greek alphabet, between the 8th to 5th centuries BC. It was specifically used in Euboea (including the town of Kymli) and the area west of Athens, and in the Greek colonies of southern Italy. The first ancient Greek alphabet was an adaptation of Phoenician, and is generally accepted as having been invented in the late 9th or early 8th century BC. Unlike Phoenician, early Greek is regarded as the first and oldest 'true' alphabet, in that it includes both consonants and vowels, each defined by a separate symbol. The Phoenician alphabet, dating from around 1050 BC, was itself uniquely successful, in that it was the first widely used script in which a specific sound was represented by one symbol, rather than using complex pictograms. This precision allowed for the development of several new alphabets, including Greek, Aramaic and early Hebrew. The Greek derivations spread throughout their territories, giving rise to several regional variations, which have been classified by historians into three groups. The so-called western, or Chalcidian, group eventually gave rise, via the Old Italic, to the Roman alphabet. The eastern, or Ionic, variant became the basis of the present Greek alphabet, especially when Athens - which used the earlier, Attic version - officially adopted Ionic as its standard alphabet, in 403 BC. The early Greek alphabet, in addition to being the first 'true' one with vowels fully represented, added some new consonants, to suit local usage of language. It thus developed into a full alphabet of 24 letters. It may be of interest to compare this trend-settingly simplified, but precise, number of characters with, for example, present-day English (26), French (26, but with seven additional diacritics and ligatures), German (26 plus three diacritics and one ligature), Irish (Gaelic) with 18 letters (plus 6 others for borrowed words), and Welsh with 28 letters including eight digraphs (double letters), Cyrillic with 33 in Russian and 30 letters in Bulgarian. Some other 'firsts': later, punctuation marks were invented, to allow readers to read aloud documents or inscriptions with greater clarity. The writings of Homer and Aristophanes include this feature, presumably to help actors the better to speak their lines. Diacritics, to represent stress and breathings, were added to the alphabet around 200 BC. In 1982, with an official simplification of the Greek language to the Demotic form, and a rationalization of the alphabet from polytonic to monotonic, those diacritics representing breathings, not widely used after 1976, were officially abolished, and the number of accents was reduced to one. Punctuation is simpler than in many of the derivatives of the Greek alphabet: the comma and period/stop are similar to those found in English; the semi-colon, and colon, are both represented by a raised dot; the question mark is shown as an (English) semi-colon; and there is no equivalent for the western exclamation mark. Punctuation marks require a space before them. The original set of letters was entirely composed of capitals, or majuscules. The much later development of informal, cursive 'small' or minuscule letters was another significant step, allowing a more relaxed, a quicker way to write on papyrus or parchment, often omitting spaces between the words. It is accepted that the Greek cursive alphabet was the inspiration for 24 of the 41 original Glagolitic letters, although some of them became significantly modified. The Cyrillic letter forms, which largely superseded Glagolitic in the 12th century AD, were more dependent on the capital, or uncial forms of Greek letters. The Greek alphabet also incorporated a logical numbering (alphabetic-numeral or Ionic) system, from about the 4th century BC, in that each letter represented a fixed number, from 1 to 900. This necessitated the inclusion of three additional letters, previously rendered obsolete, to represent the final three numerals (700, 800 and 900). In modern Greece, they are still in use as ordinal numbers, in much the same situations as Roman numerals are used in the west; for ordinary (cardinal) numbers, Arabic numerals are typically used. The Cup of Nestor can mean three things in Greek history and mythology. It is described in Homer's "Iliad" as a magnificent gold cup owned by Nestor, King of Pylos; the cup from Mycenae that was discovered by Schliemann in 1876 as he excavated grave circles at Mycenae; and there is a third, the Cup of Nestor, unearthed in 1954 at the ancient Greek site of Pithikoussai on the Italian island of Ischia. Pithikoussai was one of the earliest Greek colonies in the west, and the cup is one of the two oldest artifacts to bear ancient Greek inscriptions. Along with the Dipylon Inscription discovered in Athens, it is dated to 740-720 BC. This cup bears three lines of scratched inscription, each written from right to left, following the Phoenician practice. However, the Greek alphabet began to be written in a different manner, where the direction of writing changed with every line. This technique is known as 'boustrophedon' (meaning "ox-turning" - a reference to plowing). Even more complex was that the orientation of the letter themselves was dependent on the direction of writing as well - like looking in a mirror. This practice was an intermediate stage in the development of the Greek alphabet, and by around 500 BC, left-to-right had become the de-facto direction of writing. The Greek alphabet has shaped European culture and communication for over 2 750 years. It was the building block of a civilization that has affected us all at various stages of its spread and development. It gave us the Greek classics of literature, and the New Testament. It has given Europeans their own new alphabets. It has furnished many languages with words of universally recognized meaning. It was the means of transmitting knowledge, of recording business, of spreading social and moral values. Today, Greek is written and spoken by over 13 million people (2009 figures), and the language, simplified to meet contemporary needs, is thriving. It is officially recognized as one of the 23 European Union languages, all of which are written with variations of the Latin alphabet, except Greek and Bulgarian. The Greek alphabet retains its relevance in the 21st century (AD!). But, there is a final aspect to consider, one that has only been hinted at so far - its visual beauty. In both majuscule and minuscule basic forms, Greek letters are bold, clean, and a pleasing combination of curves and straight lines - an inspiration for all who 'traded' in letters, from their early invention right to the present day. Beautiful, in an abstract way. But immensely practical. A precise graphic description of a spoken sound - vital for accurate communication. A regular and simple form that can be penned, scratched or carved uniformly - implying order, symmetry, organization and continuity. And, yet, in informal expression - such as hand-writing - flowing, cursive, a pleasure to the eye. The academic Yannis Harambous wrote a depressing critique in 2002 on the state of Greek contemporary typography. He acknowledged the historical contribution of beautiful Greek book production over the centuries, but lamented the fact that a combination of factors had, since the 1980s, combined to cause a collapse of quality output. He cited the loss of traditional printing methods and skills, as computer type-setting of books became commonplace. In a highly technical monograph, the author spoke of a paucity of Greek computer fonts available for book (rather than newspaper or magazine) production, and pointed out the common problem of inserting Roman text (of any language) within a Greek book, in order to balance out the visual and legible characteristics of each language on the printed (or electronic) page. Thankfully, there are other, more optimistic views concerning the future of Greek alphabet typography. A young self-taught typographer and calligrapher (a science graduate, interestingly), Panos Vassiliou, founded a small company in Athens, partly for the purpose of adding to the rich tradition of producing Greek lettering in our contemporary world, both alone and in juxtaposition with other alphabets. "Greece has an extraordinary position, typographically speaking: it’s one of the few countries in the western world with a principal language that has its own script. That must have enormous implications for typography and design..."
"I wouldn’t call it implications but rather opportunities in typography as well as graphic design," Vassiliou replied, adding: "Greek typography remained stale for hundreds of years. While the rest of Europe was busy evolving during the Renaissance, Greece was badly fighting to survive the Ottoman occupation. This greatly affected typography, which did not progress for more than 400 years." He also referred to the problems described by Harambous, but added that there had been a booming development in Greek typography since the 1990s, one that was slowly beginning to appreciate the strengths, the subtleties - and distinctions - of Greek lettering, noting that innovative design was now, fortunately, leading to a more professional climate, to new challenges in the market, and led by young professionals like him. The Greek language today may not be among the world leaders. 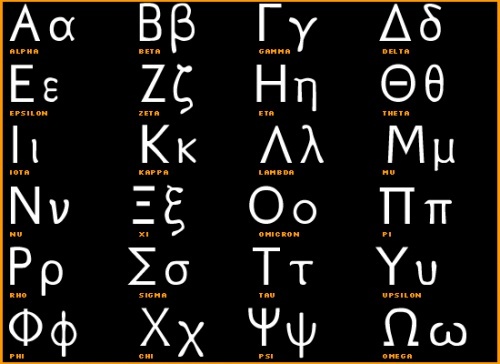 The Greek alphabet may not therefore be the most significant world alphabet nowadays, despite being recognized as an official language in several countries. However, each and every one of us European owes the alphabet a place of honor and affection in our hearts and minds, for so many reasons. Historians, scientists, mathematicians, poets, linguists, artists and craftsmen, indeed entire civilizations, all bear their own debt of gratitude for the invention of this alpha-numeric code of 24 units. And we, on our next vacation to Greece, should pause to reflect on our woeful incomprehension of an Athens taverna menu, and on what we are missing - the vibrant, clean and colorful expression of a language and thus a culture that, over centuries, has helped to form and inspire us all.